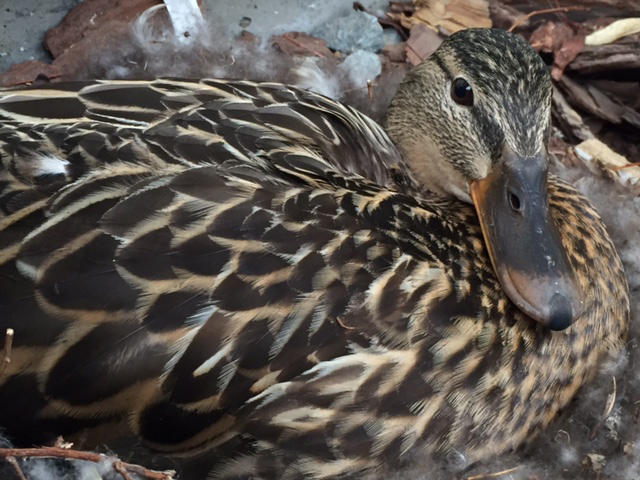 Posted on May 2, 2016 by Ryan D.
What would you do if you discovered a mother duck incubating a nest full of eggs in your fenced-in backyard? 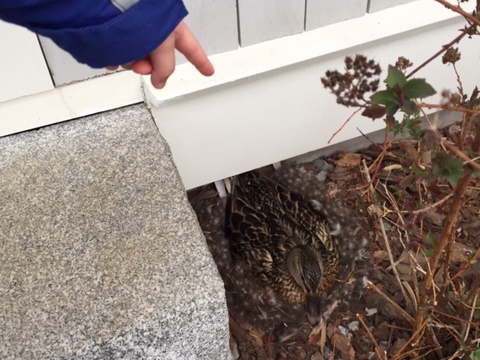 One Newton family found themselves in just such a situation when a mallard (dubbed “Quackie” by five-year-old Dylan) laid a clutch of eggs right beside their back door. Quackie chose a sheltered corner of the yard by the back door to lay her clutch of eggs. Initially, they were concerned that their golden retriever, Quincy, would bother the new neighbor, but the gentle bird dog, described fondly as “descended from stuffed animals,” showed no interest in Quackie. But they foresaw a larger issue. Their home is a mile from the nearest body of water, with a busy road in between, and they worried that Quackie would need human intervention to transport her hatchlings to a safe location. 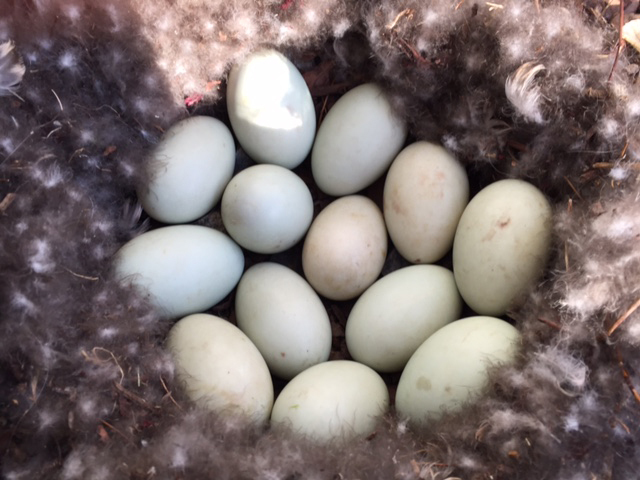 They did some research and learned that mallard eggs are incubated for 27-28 days, leaving them about three weeks to make a plan. Quackie will incubate her clutch of eggs for 27-28 days. Should they call Animal Control to transport mother and eggs to a water source? Or wait until the eggs hatch? How should the birds be moved? And where to bring them? They reached out to Mass Audubon where Joan Walsh, Director of Bird Monitoring, and Marj Rines, of Mass Audubon’s Wildlife Information Line, delivered the answers they needed. Marj added that it’s not uncommon for ducks to lead their hatchlings for more than a mile to their pre-chosen body of water. Relocating her to the wrong spot could inadvertently make her job harder. Marj stressed that it’s important NOT to feed Quackie while she’s incubating. Food can attract predators that find duck eggs a tasty treat. Quackie goes off to feed twice a day on her own, a ritual that is actually called recess! Joan walked the family through the hatching process, which can take a couple of days from first cracks to when they leave the nest. In the end, they all decided it would be best to let nature take its course, perhaps opening a gate once the eggs start to hatch. As a last resort, the family may need to marshal a Make Way for Ducklings-style parade to help with any road crossings or obstacles. We’re looking forward to an update on Quackie’s progress sometime around May 9-12, 2016! Quackie poses for an adorable close-up. We’re wishing Quackie the Mallard and all her hatchlings the best of luck! For more on what to do if you find a duck nest in an enclosed space, visit our website for Duck Situations & Solutions. This entry was posted in Stuff We Love on May 2, 2016 by Ryan D..
Now it is June 20. What happened to the family? Did they make it to water?